State Bird is the Roadrunner. New Mexico got its name as a reference to Mexico by the Spanish. The Four Corner Monument can be found in Colorado, Utah, Arizona, and New Mexico. New Mexico’s official state animal is the Black Bear, in honor of the little cub that was found in a fire in 1950. The cub became Smokey, the Bear. During the first weekend in October, the world’s biggest enchilada is made in Las Cruces. Yum! 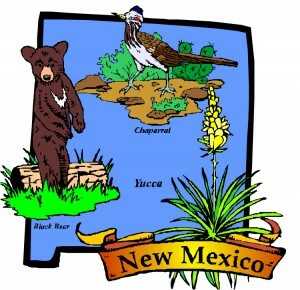 My “Catch an Honest Thief” is set in Socorro, New Mexico! Sorry, Maria, I will definitely add you to the New Mexico list when I get home…. From Sadie’s in Albuquerque of course. Nothing to do with New Mexico, but ……I just finished reading Town in a Blueberry Jam & Town In A Lobster Stew by B.B. Haywood. Liked them. This could be a fun series. It will be interesting to see how the character evolves. Did you know that BB Haywood is actually two people, a husband and wife? Not a cozy, but the WWI books by Charles Todd: mother and son and in two different states. Great list! Thank you for putting it together- I will share it with my readers. Thank you, Lynn, for sharing the list with your readers! What do you think of J.A. Jance’s series with Joanna Brady, I think it is New Mexico or maybe it is Arizona – oh well I tried and it is a really good series. Thanks for sharing today. I have read many of J.A. Jance, McGarrity and all of Hillerman. His daughter is continuing the series and I haven’t read her books. I lived in New Mexico 25 yrs. and found only a few errors on places in NM. Gloria, it looks like you have the New Mexico mystery theme covered! The Kevin Kerney series by Michael McGarrity is another New Mexico series that I really enjoyed. It isn’t a cozy, but the author develops the characters and makes you care about them through the series. I don’t know if he is working on another book. I have read everything he has written thus far. If anyone knows, would you let me know? I really enjoy this website and find the month-by-month publishing list invaluable. Thank you, Suzy, for both the kind words about the site and for reminding me to add Michael McGarrity to the New Mexico list. I’m a huge Tony Hillerman fan and not only read each of his mysteries more than once, but also read all of his nonfiction books as well. Also, there is a three movie DVD set that I really like as well. I lived in Arizona for a year (2006) and visited the four-corners area, and traveled all around the area where the Hillerman books were based. Spent several weeks in the area. Also, to respond to an earlier comment, just finished the latest J.A. Jance – Fatal Error – with Ali Reynolds. Have you done an Arizona list yet? (This isn’t a cozy, though, is it?). Love how you collect these state-related mysteries. Some time ago I read a couple of books set in the Santa Fe area (I think, although it could have been Gila/Silver City) in which the main crime solver is a blind native american sculptor. I can’t remember the author and wonder if he/she has any more books out. Can anybody out there ID the author for me? Steve, I believe you are looking for the author Jake Page. The first book in his Mo Bowdre (Santa Fe) series is The Stolen Gods. Thank you, Sue, for telling us about Steven Havill’s Posados County mysteries. And they are terrific reads! Anne Hillerman has published a sequel to her dad’s series and it is great. It features Bernadette, who married Jim Chee, and is a continuation with the same characters I’ve loved for decades in Tony Hillerman’s books. Thank you, Suzi, for telling us about Anne Hillerman’s new mysteries. Thank you, Phil, for telling us about Steven F. Havill’s Posadas County Mysteries. I spent over 30 yrs in NM and Hillerman and McGarrity were my favorites. I have read every book by Hillerman a couple of times each. I like J.A Jance series too. Gloria, it sounds like you enjoy southwestern mysteries. Patrice Greenwood has a tearoom themed mystery series set in Santa Fe, The Wisteria Tearoom Mysteries. The tearoom tea and foods are always a part of the story I enjoy! Thank you, Kim, for letting us know about Ptrice Greenwood’s Wisteria Tearoom Mystery Series (A Fatal Twist of Lemon is book #1). The Rachel Blackstone Paranormal Mystery Series by G G Collins. Santa Fe, New Mexico. I’ve read most of the books/series mentioned and I enjoyed/loved them all. Hillerman and David & Aimee Thurlo mysteries are wonderful! Havill’s books are great! I’m so glad I accessed your website, found some authors/books I have not read. I’m leaving my email address just in case new authors/books become available. I love to read about New Mexico, I lived there for 3 years and cried when I had to leave. Thank you so much for the list and info. Anne, I hope you are able to check back occasionally to see if/when we add new authors. I just finished reading one of Ann Myer’s Santa Fe mysteries and enjoyed how much she highlighted about this beautiful city.